Miss Feet Down First, under jockey Oscar Cordova, winning the $200,000 Southwest Juvenile Championship at Zia Park Sunday afternoon. 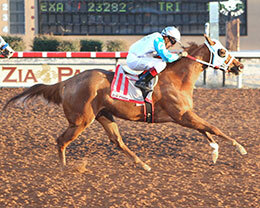 HOBBS, NM�DECEMBER 6, 2015�Miss Feet Down First scored her fourth consecutive win Sunday with an impressive 1 � lengths victory over Eagles Span in the $200,000 Grade 1 Southwest Juvenile Championship at Zia Park. Post-time favorite Bv Midnite Express finished a neck back in third. Ridden by jockey Oscar Cordova, Miss Feet Down First broke first and extended her lead throughout while covering the 440 yards in :21.617 seconds, a 94 speed index into a 5 mph headwind. The daughter of first crop sire DOMINYUN entered the championship off a dead-heat win with Game Changes in the $297,831 Hobbs America Futurity(G2). Trainer Carlos Alvidrez trains Miss Feet Down First for owner Esequiel Porras. Bred in Texas by Isbell Charolais, the sorrel filly is out of the First Down Dash mare Feet Down First. She has compiled a record of (8) 4-1-1 and the $115,200 Southwest Juvenile purse boosted her seasonal earnings to $220,122. The sharp filly has not been beat since finishing second in a Rainbow Futurity trial last July. She also won her trials for the Hobbs America Futurity(G2) and All American Futurity(G1). Eagles Span races for owners Tom and Bill Maher and trainer Jason Olmstead. Cody Smith rode the royally bred colt. Already a two-time futurity winner this season the sorrel colt added $40,800 for finishing second to bring his bankroll to more than $152,000. Entrust Rt Ser Inc/Fbo Tiffin bred Eagle Span in Texas . Heritage Place Futurity(G1) winner Bv Midnite Express settled for third, earning $24,000 for owner/breeder Bella Vista Farms, LLC. Eddie Lee Willis trains the gelding with Russel Hadley getting the riding assigment. The $24,000 show check brings Bv Midnite Express' earnings to $659,252. Brave Heart was disqualified and placed eighth and Game Changes was disqualified and placed 10th for interference. Completing the official order of finish Good Job Honey, Streakinjess For Lmg, Lets Get On Board, My Royal Wagon, Brave Heart, Memphis D Nasty and Game Changes. This Is A Deal was scratched at the gate.